My first attempt at making madeleines was only recently, just before Mikey passed away actually. I relied on a trusted source to guide me, and while the batter tasted amazing, and the finished product was quite good too, my madeleines looked like they’d been through a war. I broke a sweat trying to pry them from the pans with my offset spatula. Figuring I didn’t use enough butter or flour to coat the pans, I immediately started a second batch. Mikey looked at me like I was nuts, but he knew my drive for perfection was ceaseless and I wouldn’t give up that easily. Then my second batch came out of the oven. They seemed to stick to the pan, again. So I did what anyone insane baker would do, and moved onto batch three immediately. This is where you’d add the explicatives because, yes, those little bastards still stuck to the pan. I went to bed tired, annoyed and feeling defeated. I talked to my girlfriend the next day who’s from the South of France. She grew up making madeleines the way we Americans are reared baking cupcakes. She asked me if I tapped the pan on the counter. I told her yes, gently, but nothing happened, so I had to practically chisel them from the pan. She then told me, no, not gently, give it a good bang on the counter. And that’s when I realized maybe making madeleines wasn’t for me. Marina makes amazing ones from scratch, and there are two bakeries nearby that could cure any cravings. I just didn’t have the courage to attempt a fourth batch. Banging is something we don’t normally do in baking. We punch dough down, though really, a gentle knead, and sometimes no knead at all, will do. But that’s about as forceful as we get when it comes to the delicate, precise nature of baking. I brought home some madeleines after having coffee with Marina at Colson’s last week. Along with the cakes, I brought home determination. I would conquer madeleines before the week was over. I went back to the first recipe I attempted last summer. It was a stop and start affair, pre-empted by no less than three tantrums EACH from Isabella and Virginia. A few doors slammed, time outs were given, and all the while my friend Rosemary quietly read and didn’t cast judgement on my parenting style, or lack of it at that moment. Meanwhile, my eggs had been beaten until thick and creamy, and rebeaten as I was sure they deflated a bit during the girls’ episodes. More than an hour after I started out, my madeleines emerged from the oven, along with a pit in my stomach—it was time to give the pan a whack. Honestly, I had enough frustration with the kids to get out, and fear has pretty much been stripped away since one of my worst came true on August 7th. I gave the pan a bang against the counter, and two madeleines broke free. They were perfectly unharmed and intact. Another bang, and a few more joined the rest, magazine worthy, picture perfect on the cooling rack. Two or three more whacks and voila!—one dozen madeleines, ready to enjoy with our afternoon tea. The recipe was mostly fine all along, it was just missing the most crucial direction—bang the damn pan to release the cakes. 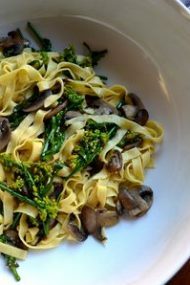 Tantrums subsided, Rosemary stayed for dinner, and once the girls were bathed, tucked in and Rosemary back in the comfort of her own apartment, I went back into the kitchen. My intention was to make another basic batch of madeleines, but then I started thinking about Valentine’s Day and what I would’ve made if Mikey were still alive. 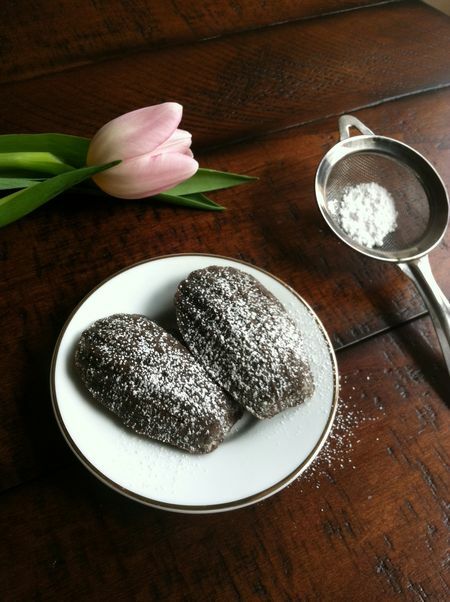 He loved pistachios, and since they’re a great pairing with chocolate, it seemed only natural to create a new recipe for him—chocolate pistachio madeleines. It was this time that I learned another little trick—let the batter rest a few minutes before filling the pans. The first batch, I only bake one tray at a time, was very delicate and the flavor was good but not as chocolatey as I’d hoped. I figured I’d go back into the test kitchen and tweak the cocoa-flour ratios. They were also missing the infamous “bump”, but even Marina says hers don’t always come out with one, so I didn’t stress about it. When the second batch came out of the oven, not only did they have a better shape, but the color was deeper, more dark cocoa-looking than milk chocolate, and the flavor more intense. So, two cardinal rules of madeleine making—patience and aggression, an odd combination, don’t you think? 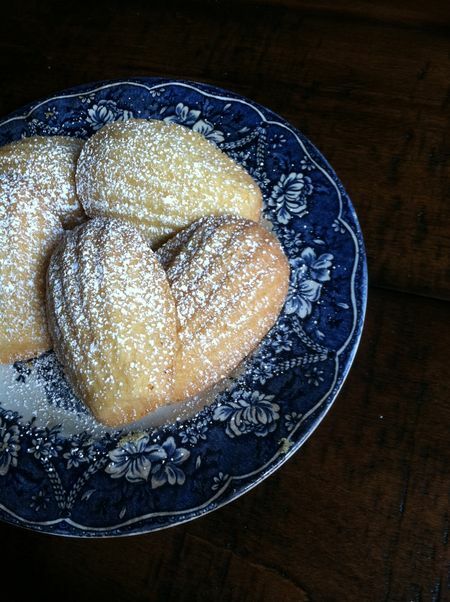 I’m going to make these madeleines again come Valentine’s Day. My main squeeze may not be here but I have two little sweethearts that will surely love them. As crazy as they drive me— single parenting a 3 and 8 year old is a non-stop marathon, they are the other loves of my life. Until, of course, the next tantrum. You want to chop the pistachios very fine, into a grainy, sand-like consistency. You can use a mini-chopper for the job, but I find it very therapuetic to do it by hand. I also only have one madeleine pan, so I just wash it as soon as the first batch is done, then dry it thoroughly before greasing and flouring for the second batch. 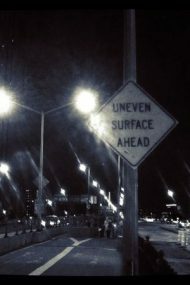 It sounds like more of a pain than it is in actuality. In a small pot, over medium-high heat, melt the butter until it becomes brown and fragrant, but not burned, about 10 minutes. Remove from the burner, and set aside to cool while you proceed with the rest of the recipe. In a medium bowl, whisk together the pistachios, flour and cocoa until well mixed; set aside. In a stand mixer or deep bowl, beat the eggs on high speed until they are thick and have tripled in volume, about 4 minutes. With the mixer still on high speed, slowly pour in the granulated sugar. Once all the sugar has been added, beat for 2 more minutes. Lightly sprinkle the flour mixture over the egg mixture. Using a rubber spatula, fold until the batter is just mixed. Pour in the melted butter and gently fold, just enough to mix the batter until there are no pools of melted butter. Let the batter rest for 15 minutes. Meanwhile, generously grease the madeleine pans with butter—I mean really generously, get into all the grooves as well as the top rim of the pan. Coat with flour, tapping off any excess. Gently spoon batter into one of the prepared pans, filling the molds about 2/3—do not overfill. Bake for 14 minutes, remove from oven and vigorously tap (code for bang) pan on the counter, which will release the madeleines from the pan. Set on a wire rack to cool completely. Fill the second pan with batter, then bake and remove from pan as directed above. When cool, sift Confectioner’s sugar over the madeleines, if desired, before serving. Courage and perseverance. You are an amazing cook and mother. Fitty fits we call them at our house and they can be over the top and so very frustrating. Always good to be on the other side of them. To be on the other side of them with a madeline in hand, well, that is ideal! Pistachios and chocolate? Heavenly. I’ve made Heidi’s madeleines before and, like you, found it nearly impossible to remove them intact from the pan. As a result, I’ve not made them again despite the fact that they tasted delicious. Thanks for the banging tip, I’m excited to get back in the kitchen and try again. I only recently made madeleines for the first time too. From that I learnt to make up the batter & leave in the fridge tightly covered overnight or for at least a few hours. It gives you that characteristic bump every time! They look very very appetizing. I love the process of discovery and you write about it beautifully here. And I love when something turns out to have a simple solution…a technique that, when applied, just works! Thanks! Yeah! You wrote again. I must say I look forward to your writings. Isn’t life like a bunch of Madelines? You are cooking and prepping nicely, everything is goin OK and then bam, everything is stuck! No matter how you try to unpry (your life) it can’t be done.! Then someone, or something comes along(maybe just some kind action or advice) and your are (easily it somehow seems) unstuck. (well at least for the moment)May your “Madeline Life” continue to become unstuck for you. 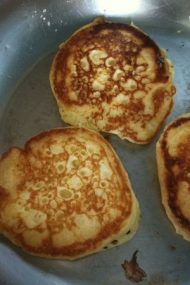 They look delicious, thanks for the tip of banging the pan, I never would have guess it. I was taught to mix some flour and softened butter together and “grease” pan..no bang but never sticks. JP’s note: love that tip Lola. I’ll definitely give it a try! Madeleines are so much fun! I wasn’t raised making them, but I certainly have been converted! Good on you for not giving up! Thank you for another wonderful post. I have your site bookmarked, and it makes me so happy when I see you’ve written something new. Your strength continues to amaze and inspire me. Thank you, again, for sharing your story with the world. Patience and aggression! I’ve been trying to figure out the combination I needed to attack my life today and that’s it. I’ll make some Madeleines to go right along with my new motto. This post was just what I needed. Thanks! You are a wonderful writer, Jennie. Your blog is one of my favorites to read. It’s always reassuring to know that others get frustrated and that recipes don’t always work on the first, second or even third try. I’d definitely save those madeleines for days when you NEED to bang something on the counter! Happy Valentine’s Day to you and your little ones. The chocolate pistachio version must be really tremendous. I’m a little nervous after your description of the banging, but I think I’ve got it in me. I’m very impressed by your tenacity in the kitchen. Three attempts in one night- wow. I have never made madeleines, but these are tempting me to try it! They look delicious, Jennie! That did make me smile Robynne. Thank you for that.